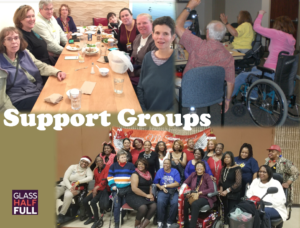 Support Groups: Attend, Launch, or Facilitate – Glass Half Full with Leslie Krongold, Ed.D. It’s all about support groups! Listen to several support group facilitators talk about their experiences attending and eventually facilitating a support group. Patient advocacy organizations represented include the Muscular Dystrophy Association, Multiple Sclerosis Foundation, and the FSH Society. Support groups organized through MeetUp cover chronic illness and life transitions. For more information about launching a support group, check out this recent article in Quest magazine. Feel free to comment here or on our Facebook page. If you facilitate a support group and want to be part of the conversation, contact us. I think tbis pidcast eascreally inspiring. My online support griup is going well but not my in person one but listing to these other facillitators makes me want to get mt in perxon group back into action.